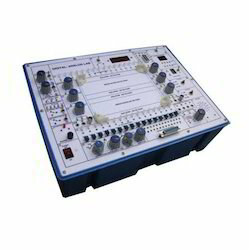 We are a leading Manufacturer of digital analogue lab, line multiplexer, digital logic trainer (ttl) kit, logic gates circuit trainer kit, ultrasonic digital distance meter trainer kit and digital lab trainer kit from Jaipur, India. The Digital-analog Lab Is Intended for elementary as well as advance training of Digital & Analog electronics. The trainer covers regular digital & analog circuits by solder-less Interconnections on breadboard and as well as compatible with all optional modules, through use of 2mm brass terminals and patch cords. Various clock generators, logic level Input/output Indicators and DC regulated power supplies etc. are In-built. The unit housed In attractive enclosure is supplied with mains cord, patch cords, Instruction manual and Component Set. With an increase proportion of technology, we are manufacturing, trading and supplying Line Multiplexer. 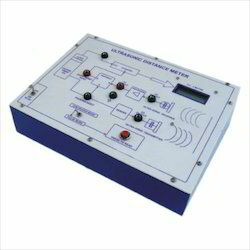 The given range of line multiplexer is provided in several specifications accordingly to the customer’s needs. This line multiplexer is designed using excellent quality material and sophisticated technology under the keen observation of our competent professionals. Our offered line multiplexer is provided at very reasonable prices. Digital Logic Wainer (TTL) / Logic Trainer Board based on 74 series has been designed specifically to make the students familiar with the study of 1TL ICs and verification of the troth table of logic gates, flip-flops, Gated & Master Slave OK flip-flops, Schmitt Trigger, Expanders , Binary address, Counters, Shift registers, Multiplexer (Encoder), DernultIplexer (Decoder), 8 Bit D/A Converter and 8 Bit ND Converter etc. 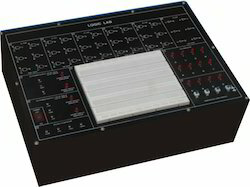 Large area of Bread Board is provided on the front panel for ICs. 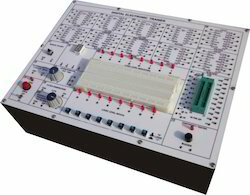 Students can make the circuit easily on the Bread Board with the help of other accessories which are provided untie front panel of Digital Logic Trainer. 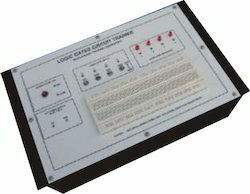 Logic Gates Circuit Trainer offers a unique entry Into the world of microelectronics. The system combines simple, easy to use, ICs for various gates and flip-flops, power supply, clock input and output state with aversatile soldedess bread board area. Students new to digital electronics can implement logic circuits In a matter of minutes on the bread board area. 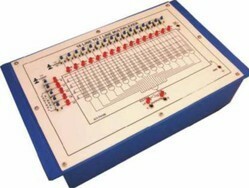 As confidence grows the student will naturally progress for using more complex logic ICs on the large bread board area. This unique approach enables the unit to be used by the absolute beginner, yet It may also be usefully employed In advanced project work. The many outstanding features of the logic trainer, combined with Its ease of use and robust housing, make it the first choice for those wishing to introduce students to digital electronics for the first time. Practical experience on this board carries great educative value for Science and Engineering Students. 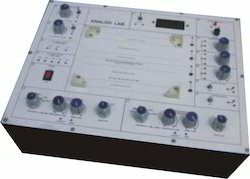 Analog Lab is intended for elementary as well as advance training of analog electronics. The trainer covers regular analog circuits by solder-less interconnections on breadboard and as well as compatible with all optional modules, through use of 2mm brass terminals and patch cords. 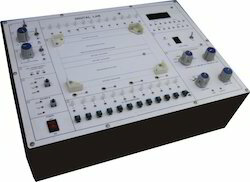 Various DC regulated power supplies, Function Generator, DMM, Continuity Tester etc are in-built. The unit housed in attractive enclosure is supplied with mains cord, patch cords, Instruction manual and Component Set. The Digital Electronic Trainer is intended for elementary as well as advance training of digital electron's. The trainer cover regular digital drcults by solder less Inter connections through use of 2 mm brass terminations and patch cords. Various dock generators, logic level input/output indicators and DC regulated power supply are in built. The unit housed In sunmlca finished wooden box enclosure with provision for safe keeping of mains cord, patch cords and top lid for protection during storage. Logic Trainer is designed for the logic beginners to enhance the comprehension of basic logical theory. The digital lab covers regular digital circuits by solder-less Interconnections on breadboard and as well as compitable with all optional modules through use of 2mm brass terminals and patch cords The design of the equipment is easy to operate and understand. It Is equipped with various kinds of basic logic gates, debounced logical switches, LED indicators, DC power supply with short circuit protection, pulse generator and solderiess bread board. The unit housed In attractive enclosure Is supplied with mains cord, patch cords, Instruction manual. Learners in high schools, Polytechnic Colleges and Universities, can use the trainer as independent activity tool.